Nuke Pro: 2018 Tax Reform, How Should It Really Shake Out? 2018 Tax Reform, How Should It Really Shake Out? 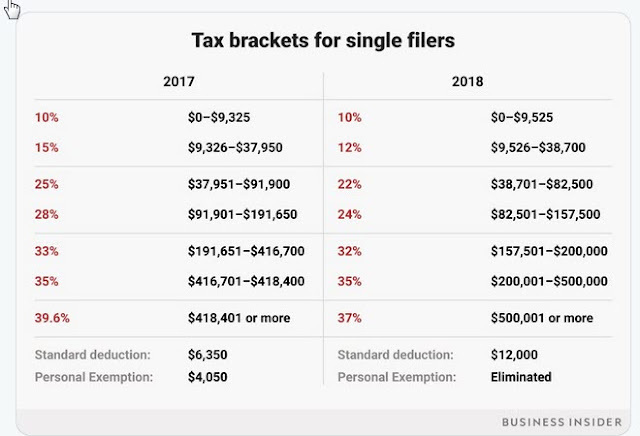 There is some totally unsupported "meme" by the Globalists that Trump's tax plan is actually increasing taxes on the middle class in order to funnel money to the 1%. At least Kamala Harris says so. The average tax refund is down about $170 compared to last year. Let’s call the President’s tax cut what it is: a middle-class tax hike to line the pockets of already wealthy corporations and the 1%. There was also revised guidance on witholdings. Basing even an unsubstantiated claim based on tax refund amounts, is disngenious at best, and fairly evil at likely. Looking at amount made and % of that in tax, would make more sense. But looking at the table, is there any chance that overall that people under $200,000 per year will pay less Federal tax?